As great and awesome as it is to have your own custom website for your church, not everyone can afford a designer, design agency or have someone with web design chops in the congregation. That’s when purchasing a premium WordPress theme is a viable option. Other than your regular web hosting costs, you’ll easily spend under $100 for a fully functional theme–usually with some sort of support offered. 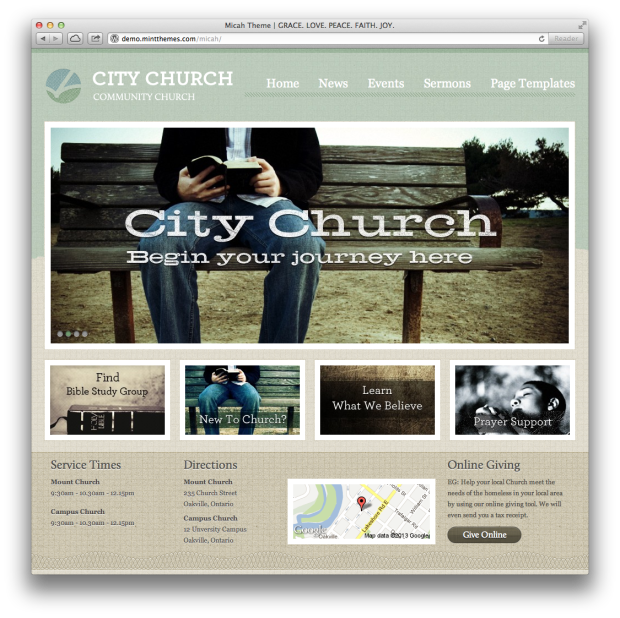 Your church will have a rockin’ looking website, without all cost. 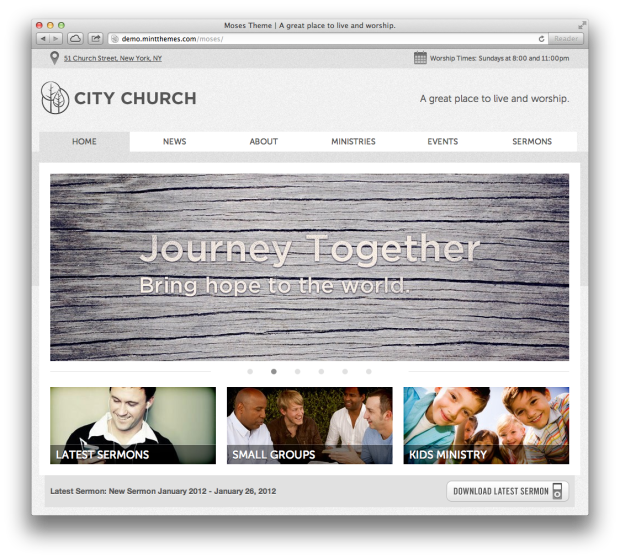 As for keeping it ‘personal,’ you would be surprised with how personalized your church website will feel after adding your church logo and adding pictures and content that’s specific to your congregation. The church address is easy to find–complete with Google Map integration, along with built-in podcasting setup and an online donations option, too. This theme is really clean. If you can handle some CSS action, this would make a decent starter theme for building out a church website. Just splash some color here and there and you’re done! Trinity is available for free, but to dig into the Church-centric elements, you’ll want to pay for the premium version. If you spring fro the fully loaded version, they’ll even give you a PSD file for design. This theme is a lot like Micah, but with some nice extras added. This theme is packed with plenty of punch, but is heavily designed; so unlike the Trinity Theme, making dramatic design changes will take some time. 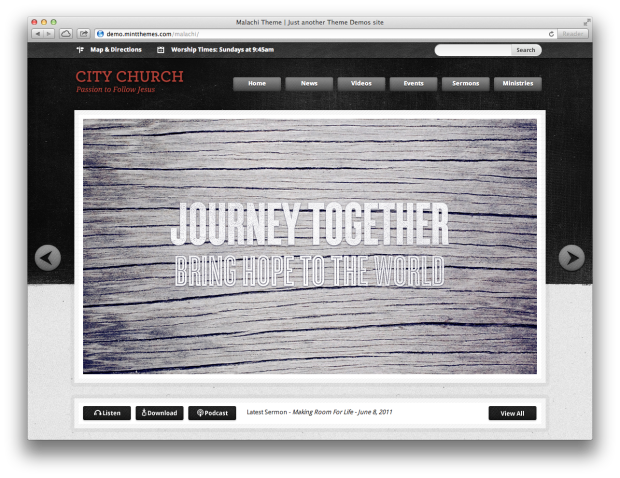 The Malachi theme is great for video-based designs, as adding video and media content to the main slider is easy to do. 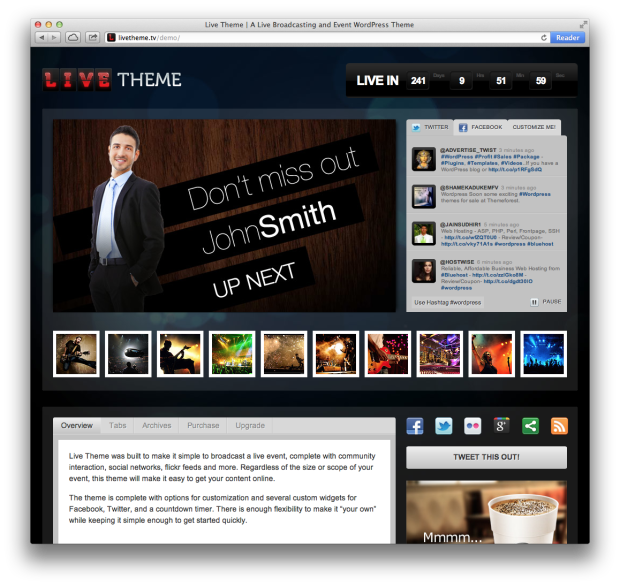 However, if you’re looking for a robust video-based theme for your church website–like streaming live sermons–I would recommend Live Theme. Like all the other themes I’ve listed (except Trinity), this is another theme by Mint. It includes the ability to post sermon MP3 files with Podcast functionality, events, and news articles. Owners can include links to Facebook, Twitter, and more with the click of a button. In addition to a full PSD file for your designing pleasure, Moses comes with 5 different styles right out-of-the-box. What WordPress theme would you recommend for churches? 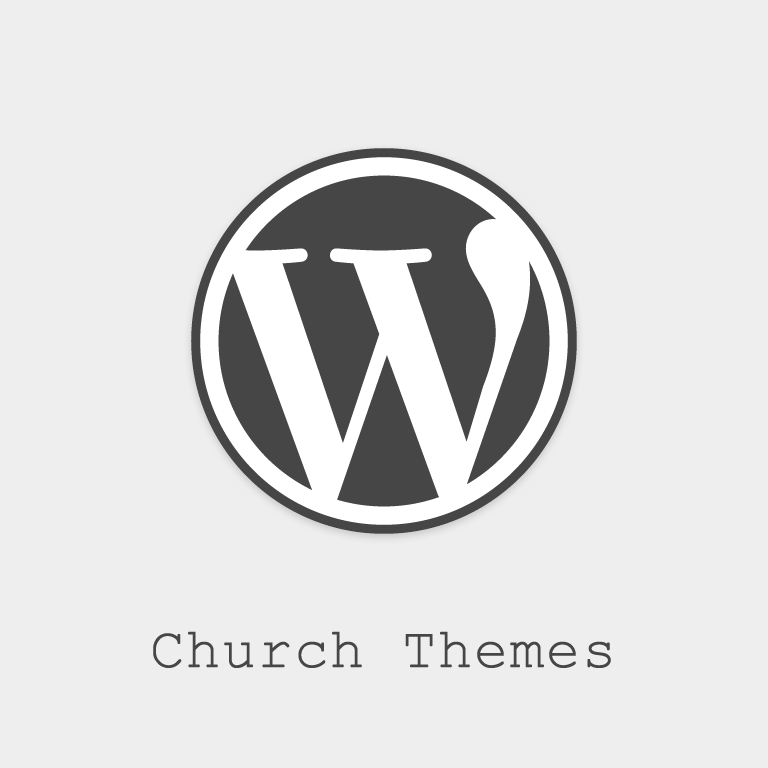 I love that there are developers getting into the niche of wordpress themes specifically fr churches. For a long time I have been modifying themes (woothemes and themeforest mostly) trying to get the functionality I wanted. The problem I run into is flexibility. Some of these are coded in a way that makes it harder to tweak. Churchthemes specifically warns users not to modify their themes which seems to go against most developers. And there support isn’t up to par. I hope that as this field of developers grows the professionalism grows as well. Great feedback and insight, Paul. It’s great to hear from someone who really has gotten their elbows dirty doing this! Perhaps a better solution would be for plugin development. That way, you can run a solid base theme, like Standard, make your design modifications and use plugins to take care of your functionality. I actually use StandardTheme for my blog. It’s rock solid and loves to be tweaked. I’ve never had a support issue with Standard. Previous to trying churchthemes, I did exactly what you suggest. Plugins are great, but most of the clients I work with like to see it before buying and the church-centric themes are great for them. I hope mintthemes and churchthemes keep at it. There are plenty of churches who can’t afford someone to do the work and would benefit. Hopefully the support will develop as much as the design. True story. 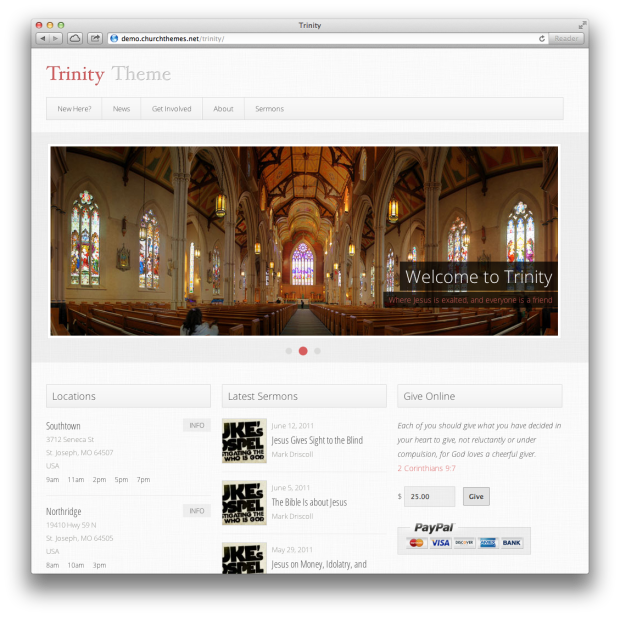 The right WordPress theme is perfect for the church on a budget. I haven’t used in the wild yet, but I love the Simple Church Child Theme for Standard 3. 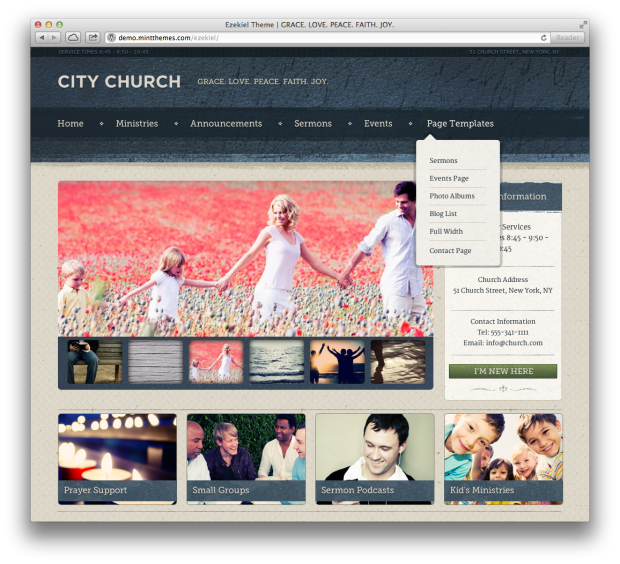 Another great theme that i’m using for my own church with some customization’s is called ChurchHope. http://themeforest.net/item/churchope-responsive-wordpress-theme/2708562 It’s extremely customizable on it’s own without having to tweak any code. I did some very minimal code changes on ours. Awesome! Thanks for the link, Michael! I’m going to second the use of a either standard or even WordPress’ own twenty twelve theme to build off of. I was a designer first and programmer second, but I find great joy in mucking about in the theme code added plugin areas and theme tweaks. I know not every church has the budget for that, but for me, starting at the foundation is fun and exciting. These themes mentioned above, while having some flexibility are somewhat strict in what kinds of function areas they have…that’s where I come in and mess around in the back end code to make the things churches want, happen. All of my themes are responsive, but I’m not sure there is any automatic way to migrate from powerpress to another solution. OH, and this one is responsive too. Are Pro Athletes More Influential Than Faith Leaders?